Practice sessions are ideal for beginners to try kart racing and for serious competitors to hone their skills. An Arrive&Drive gives the driver the opportunity to try different lines and braking points in order to become quicker. The price includes all safety equipment, a comprehensive driver briefing and all laps are timed and printouts are provided to drivers at the end of the session. 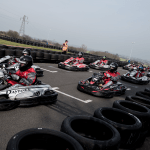 Subject to availability, Daytona Tamworth offers Arrive&Drive practice sessions on the GP Circuit for drivers aged 14+ in our SODI RT8 Karts and aged 16+ in our DMAX-GT karts. Junior drivers aged 8-15* can take part in Junior Arrive&Drive on our Indy Circuit. Senior Drivers may upgrade to our amazing DMAX-GT Two Stroke Karts if they have experience driving more powerful karts. We will also consider allowing very experienced drivers aged 14 or 15 to drive in our DMAX-GT karts subject to proof of such experience and approval being gained in advance. Practice sessions should be pre-booked and availability almost constantly and it is best therefore to book online or to phone us on 03303327870 to book. Our online booking prices include a discount off the standard prices – so check there first to see how much our Arrive&Drive costs. Click here to check availability and prices and book Senior Arrive&Drive online *please see our Juniors Information for details of minimum height limits for younger drivers.